The Obama administration was hit by another setback this weekend. Realizing that the Larry Summers nomination as the next Fed chairman was going to face some tough opposition in Congress, the president decided to pick someone else. Reuters: - "Earlier today, I spoke with Larry Summers and accepted his decision to withdraw his name from consideration for chairman of the Federal Reserve," Obama said in a statement. Of course the next obvious candidate is Janet Yellen, who is a highly accomplished economist but is thought to be even more dovish than Ben Bernanke. This took the markets by surprise, sending equities, precious metals, and "risk-on" currencies higher. Treasuries rallied as well on expectations of a more dovish Fed policy. Oil fell on a potential diplomatic solution for Syria. 1. President Obama tends to select candidates for key posts that he knows and often had worked with in the past. Neither he nor other senior members of the administration know Yellen well or had worked with her in any capacity. 2. Obama will be looking for someone who had demonstrated strong ability to deal with a major crisis. While Yellen is certainly capable and had accomplished a great deal during the financial crisis, there will be questions raised about her ability to lead the central bank and the financial system through another 2008. 3. Janet Yellen's dovish views could galvanize a number of Senate Republicans, setting the administration up for another damaging confirmation fight. 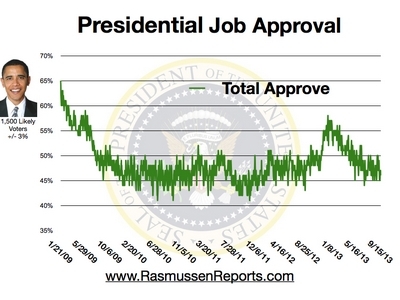 As of this weekend, the president's job approval remains relatively low. The administration may not want to rock the boat by nominating someone they may deem to be controversial. That is the reason they dropped Larry Summers to begin with. There could be another candidate at play here. And this other candidate may not be viewed to be as accommodative in terms of monetary policy. So before jumping into risk-on assets, keep in mind that Janet Yellen's nomination is not yet a done deal.